Rapid fire is all about strength and conditioning and everyday we have a different focus. During high season we run two Rapid Fire classes each day, during low season just one. The focused sessions allow you to improve in specific areas, whether that be strength, endurance, power or speed. The Rapid Fire classes differ significantly from one another and are linked to the day of the week, you can find out more about each class below. You will receive 45 minutes to work through the stations. 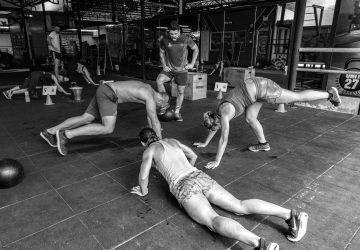 Conditioning workout at the end of the class – burn! The Rapid Fire Lower Body Strength class is a session mainly focusing on everything from the hip downwards. The class is described in detail by the Unit 27 coach after ensuring a nominal role call has been completed. Following this, the assistant coach then proceeds to take the class for stretching and a warm-up routine for up to 20 minutes. The are a number of stations, these differ each week based upon the programming of the coach. You will work as either a pair or a 3 depending on how busy the class is and will work through a number of stations maintaining complete control, and focusing more so on the stimulation of the muscle fibers as opposed to rushing. Rapid Fire Endurance is a cardio and strength endurance based session. It is completed as a chipper, either in pairs or groups of 3 (numbers dependent). The class is described in detail by the Unit 27 coach after ensuring a nominal role call has been completed. Following this, the assistant coach then proceeds to take the class for stretching and a warm up routine for up to 20 minutes. There are 8-10 stations, most stations will have a capacity of 2 groups. The pair or group will complete the prescribed amount of reps at a station before moving on to the next station. The stations can be completed in any order the pair or group prefers. The objective of the endurance session is to complete all the stations set out within your group/pair working at 100% for as long as possible. 3 people per group x 10 groups. sets and reps are completed. 5-7 minutes Plyometric conditioning at the end of each session. Cool down and stretching to finish off. Rapid Fire Power is held on every Wednesday and is one of Unit 27 signature Strength and Conditioning classes. Explosive power drills are performed to generate a quick burst of maximal effort, such as movements required in rugby, MMA, track and field, on tennis courts and many other competitive sports. The types of exercises detailed in class are to build this quick, explosive power that requires a maximum or near maximum power output from the athlete in a short amount of time. The goal of explosive exercise training is to ultimately move weights relative to an individual very quickly. But to get to that point safely, without risking injury, it's important to start with light weights and slow controlled movements before increasing weight. Over a matter of sessions the weight lifted and speed at which it's lifted will be increased. You are paired into groups of 2 or 3 and will work in rotation throughout the duration on the class. Class is designed so each individual can work to their own limits in a controlled environment expect in this class to be throwing, slamming, jumping, swinging etc. All exercises are suited to each individual’s capabilities. Class as always is overseen by qualified instructors. Popular exercises include Tyre Slams, Prowler Drives, High Box Jump, Battle ropes , Various Resistant Band Exercises and many more. The class is described in detail by the Unit 27 coaches after ensuring a nominal role call has been completed. Following this, the assistant coach will then proceeds to take the class for stretching and warm up routine for up to 15 minutes. There are 9 stations set out on both sides of the gym, at each station 2 groups can work simultaneously so equipment is plentiful. At the end of 45 minutes Explosive Power session there is a final Plyometric Conditioning session which last 5-7 minutes to get your heart rate into fat burning zone burning them extra calories. Equipment then gets put away for cool down and stretching. The Rapid Fire Upper Body Strength class is a session mainly focusing on everything from the hip upwards. The class is described in detail by the Unit 27 coach after ensuring a nominal roll call has been completed. Following this, the assistant coach then proceeds to take the class for stretching and a warm-up routine for up to 20 minutes. There are a number of stations, these differ each week based upon the programming of the coach. You will work as either a pair or a 3 depending on how busy the class is and will work through a number of stations maintaining complete control, and focusing more so on the stimulation of the muscle fibers as opposed to rushing. The day that we put everything together into one huge class! 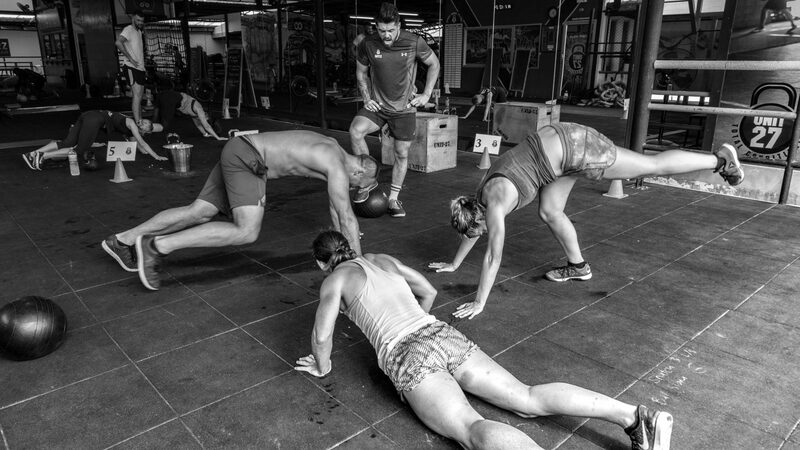 The Rapid Fire Circuits class is a great way to reach the end of your strength and conditioning week of programming, and compromise everything you have developed. With all elements already worked upon, you can utilise your new found skills, strength and speed to reach new maximal efforts compared to the week before. The class is described in detail by the Unit 27 coach after ensuring a nominal roll call has been completed. Following this, the assistant coach then proceeds to take the class for stretching and a warm up routine for up to 20 minutes. Coach divides class into 2 or 3 Teams depending on how busy the classes. targets which will be given. Adequate rest periods after each task performed. Final Score tally at the end of class to establish winning team. Rapid Fire Wild Card is held on every Saturday at 11 am and is one of Unit 27 signature Strength and Conditioning classes. After a hard week of training its time to group together not as individuals but as a team and demonstrate that together multiple heads are better than 1. Wild Card is all about team work, working together to achieve specific goals and targets set out for you by the coach and introduce that competitive edge to your training. Expect on Saturday morning to be having lots of fun as well as getting one hell of a workout for the duration of the class. Popular exercises expected in this class are Max calorie rowing/assault bike, Equipment Carrying, Sled Pushes, Farmers Walks and much more await you. The class is described in detail by the Unit 27 coaches after ensuring role call has been completed. Following this, the assistant coach then proceeds to take the class for stretching and warm up routine for up to 20 minutes. Each station (4) lasts about 10-15 minutes where you and your team will expect nothing less than 100% effort in order to achieve maximum results. Each team will perform each station once with an adequate rest break in between until all satiations are complete, final score tally at the end of class to decide overall winner. The equipment then gets put away for cool down and stretching. Don’t miss out, class space is limited to 30 per session, book early or contact us about package deals and plans!